If a substance dissolves in a liquid, it is called a solute and the liquid is called the solvent. The resulting mixture is called a solution. Saturated solution A solution which will dissolve no more solute. Soluble substance A substance that will dissolve in a solvent. The concentration of a solution tells you how much solute is dissolved in 1 unit volume of solution. The volume of a solution is measured in dm³ (litres). 1 dm³ = 1000 cm³. The amount of solute can be measured in grams or moles. Concentration is the number of moles of solute per liter of solution. A concentration of 10 g dm-3 means there is 10 g of solute dissolved in1 dm3 of solution. Calculate the concentration of the solution if 28g of NaOH is dissolve in 250cm3 of water. Molarity is probably the most commonly used unit of concentration. It is the number of moles of solute per liter of solution. A concentration of 2 mol dm-3 means there are 2 moles of solute dissolved in 1 dm3 of solution. The chart above shows how to convert the units of concentration from g dm-3 to mol dm-3 and vice versa. 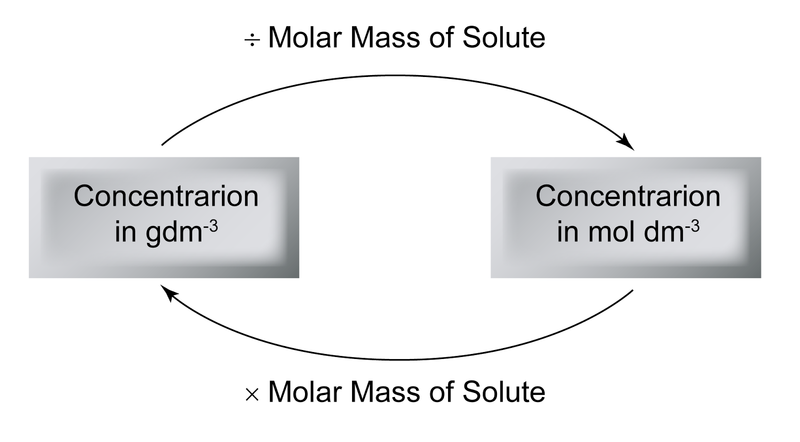 The molar mass of the solute is equal to the relative molecular mass of the solute.